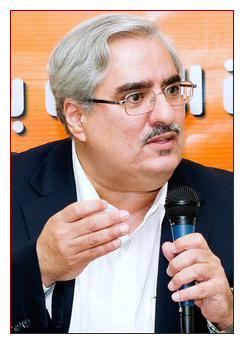 Ebrahim Sharif is a 58-year old Bahraini politician, businessman, husband, and father — and a political prisoner. He is the former Secretary General of the National Democratic Action Society (also known as Waad), a secular, moderate, and peaceful political opposition group in Bahrain. He spent 4 years and 3 months in Jaw Prison – Bahrain then released on a royal pardon on June 19th, 2015. He was re-arrested on July 12th and held in custody until his verdict from Bahrain’s Higher Criminal Court which issued was finally issued on February 24th, 2016. He was sentenced to one year in Jaw Prison for “inciting hatred against the regime” and is expected to be released in July 2016. The charge of “inciting to overthrow the ruling system” was dropped against him, however, the Public Prosecutor has expressed the possibility of appealing Ebrahim’s acquittal. Click here to read WAAD’s statement on the recent groundless charges. On June 19, 2015, Ebrahim was released by a royal pardon after serving a bit over 4 years of his 5 year unjustified sentence. He was rearrested on July 12, 2015, a mere 3 weeks after his release, for practicing his rights to freedom of speech and expression during the Annual Commemoration of the Martyr Hussam Al­Haddad. The speech called for reform and an end to discrimination plaguing the country. He encouraged peaceful resistance and echoed the EU resolution, and for that he is being charged with “inciting changing the country’s political regime and publicly inciting hatred and contempt against the regime,” which carries a possible 13 year prison sentence. Amnesty International and Human Rights Watch have called for his immediate release and have confirmed that his arrest is related to freedom of expression. Click here to watch the peaceful speech that led to his re-arrest with English subtitles, Click here to read the peaceful speech in English, click here to read it in Arabic, and here for the 2012 statement released regarding the killing of the 16 year old martyr by Bahraini police. This website was created to raise awareness of his case and call for his immediate release. He is currently in police custody after a 30 day investigation (initially 15 days which were further extended to 30 days) with the initial charges being “incitement to hatred and contempt of the regime” which was further exaggerated to “incitement to overthrow the regime by force and illegal means” by the Public Prosecution. He denied all the charges against him. His sentence could carry up to 13 years as reported by his lawyers. Almost five years ago, at 2 AM, on Thursday, March 17, 2011 Ebrahim was arrested from his home by the Bahrain government. His only crime was calling for genuine democratic reforms in Bahrain. We started this website in the very beginning, when he was not allowed to contact his family for over a week after his arrest, and even then he was only allowed a few seconds to talk on the phone. He was put in solitary confinement for 56 days and his lawyer was called upon by military authorities to attend interrogation sessions only, beyond that, there was no communication for months. He was tortured for his beliefs in democracy and the torture was documented in the Bahrain Independence Commission of Inquiry (BICI) report (torture cases documented in pages 432-478). The Report has clearly demonstrated numerous cases of torture, including Ebrahim Sharif’s personal statement of his torture, the violation of his rights, the degradation of his dignity and the general mistreatment he had experienced. As of February 19th, 2016, Ebrahim is still in custody and will receive his verdict on Wednesday February 24th, 2016. Human Rights Watch issued a statement on February 17th calling for Ebrahim’s immediate release, the article can be read here. To learn more about who Ebrahim Sharif is, why he was arrested, and to read his peaceful speeches first hand, read the about page, and browse through the posts below, which will be updated regularly with new information. You can also browse his quotes on the Photos and Quotes page. You can tweet us on @freesharif, @ebrahimsharif, or use the hashtag #FreeSharif. After 4 years and 3 months in jail, Ebrahim Sharif was released on June 19, 2015 and re-arrested in the early hours of Sunday July 12, 2015 –less that 48 hours after he gave a peaceful speech at the Annual Commemoration of the Martyr Hussam Al­Haddad in Muharraq, Bahrain. He is currently in police custody and is facing groundless charges of “inciting changing the country’s political regime and publicly inciting hatred and contempt against the regime”. The trial started on August 24, 2015 in Bahrain’s Higher Criminal Court, and the verdict is expected to come out on Wednesday, February 24th, 2016. NEW: To read the statement issued by Mark C. Toner, Deputy Department Spokesperson for the US Department of State, encouraging Bahrain to release Ebrahim Sharif, click here. NEW: To read the new Human Rights Watch article urging for the immediate release of Ebrahim Sharif, click here. To read Waad’s statement on the recent Public Prosecution charges against Ebrahim Sharif, click here.